"Twentieth century has been a century of violence. Would the 21st century be a century of nonviolence? Nazareth in this paper says yes if the issues of peace and security are pursued through justice and mutual agreements based on the legitimate aspirations of both sides of the conflict situations." The 20th century has certainly been the most violent and destructive in human history. Over 90 million people have died in the two world Wars, in the Spanish and Greek civil wars, Hitler’s gas chambers, Arab-Israeli and India-Pakistan wars, and innumerable local conflicts in different parts of the world. Yet, quite possible more people live in constant dread of sudden and violent death today than at any time in the past. The collapse of the blazing World Trade Towers on September 11, 2001 has seared themselves on the human mind universally. The suicide bomber has become the new symbol of terror of our times. Even the most sophisticated surveillance systems of a super power have proved in capable of preventing terrorist attacks in broad daylight. This some what pessimistic reading of history is challenged by one major exception, Mahatma Gandhi’s application of politics and techniques of nonviolence in India. Gandhi’s success both redeems human nature from the inevitability of its historical experience and also suggests the viability of nonviolence in modern situations. When Gandhi arrived on the Indian political scene in 1915, the Russian revolution had just taken place. This and the widespread antipathy for British rule had generated strong revolutionary fervor among Indian nationalists. Their father figure was the Bengali novelist Bankim Chandra Chatterjee, whose popular novel, “Anandmath” was the inspiration for secretes societies, and its hero Satyanand, the model for “revolutionaries”. It contained the rousing hymn “Bande Mataram”. Aurobindo Ghosh was the other influential figure. Educated in England, and selected for the coveted Indian civil service he had given it up to join the “revolution”. Like many others who had studied abroad, including Jawaharlal Nehru, he was deeply impressed by the achievement of Mazzini and Garibaldi and Japan’s defeat by Russia in 1905. Besides, like the rest of India, he was outraged by British division of Bengal on religious lines in 1904. Bartaman Rananiti, ‘Modern Art of War’ published anonymously in 1907 propagated Bankim’s idea that the destruction was another form of creation and that funds for revolutionary activities must be raised by any means including terrorism. During the 1905-1915 periods, there was a spate of assassinations of British officials not only in India, but also in England. At the 1919 Amritsar congress session when Gandhi spoke about Truth and Nonviolence, Bal Gangadhar Tilak, a senior nationalist leader who had connection with and sympathies for the revolutionaries, contemptuously retorted “My friend, Truth has no place in politics”. Two decades later another nationalist leader Subhash Chandra Bose, who assessed the nonviolent approach impractical and ineffectual, secretly left India for Germany and Japan. In collaboration with the latter he set up the “Indian National army” with Indian troops taken as prisoners of war by the Japanese in South East Asia. Gandhi’s task in promoting Truth and Nonviolence within the Indian national movement was, therefore, not an easy one. He succeeded only because of his great moral strength, his total identification with the poverty-stricken Indian people, and the impressive results his nonviolent campaigns, based on mass participation, produced vis-a vis the British, 1920 onwards. Besides Tilak died in 1920 and left a more open arena for him. Gandhi ardently believed that truth was an objective moral reality as real and mighty as God himself. Truth was what constituted the “Right Path”. For him, there was no greater strength than the strength of the Human Spirit when it was imbued with Truth and was unafraid to die, unarmed, upholding it. Since Humans have been created “In the image of God” and have the “Divine Spark” in them they have to be motivated and governed by Reason and Love rather than by fear and violence. When one is steadfastly rooted in Truth, reason will always lead him along the path of Love and Righteousness. One has to live, and be ready to die, for Truth, Love and Righteousness but never to kill. 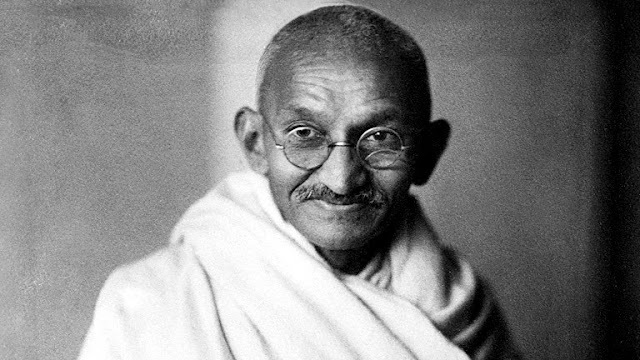 “Given a just cause, capacity for endless suffering, and avoidance of violence, victory is a certainty”, “Peace will come when truth is pursued, and Truth implies Justice” and “the end of nonviolent struggle is always a mutually acceptable agreement, never the defeat, much less the humiliation of the enemy” are the three cardinal principles of Gandhi’s trust and Nonviolence strategy. Within 30 years of Gandhi launching his nonviolent national struggle for Independence, the British withdrew from India voluntarily and among the first acts of independent India was to become a member of the British Commonwealth renamed as Commonwealth of Nations. Britain and India parted and stayed as friends. The nonviolent struggle for Independence has been amply justified. Gandhi’s strategy of Truth and Nonviolence also has had notable successes outside India. Using this strategy, Martin Luther King managed to bring about more beneficial change for his fellow blacks in the US in the single decade of the 1960s, than a bloody civil war and the subsequent one-hundred years of constitutional and legal struggle had achieved. It also brought about a fundamental transformation among them. In the 1960s and 70s, over one hundred European colonies in Asia and Africa achieved independence. This came about partly because they used the same efficacious tool of nonviolent struggle, and partly because the national movements led by Gandhi and Martin Luther King effectively changed the global mindset on the acceptability of Imperialism, Colonialism and Racism. In the 80s and 90s , nonviolent movements have successfully brought down oppressive regimes in Poland, Czechoslovakia, Romania, Philippines and South Africa. Using the same technique, one lone, frail woman, Aung san Su Ki has bravely stood up against oppressive military might in Burma and effectively swung world public opinion in support of her democratic cause. In accepting his Nobel prize in December 1989, he spoke thus: “I accept the prize with profound gratitude on behalf of the oppressed everywhere, and all those who struggle for freedom and work for world peace. I accept it as a tribute to the man who founded the modern tradition of nonviolent action for change Mahatma Gandhi whose life taught and inspired me. And of course, I accept it on behalf of the six million Tibetan people, my brave countrymen and women inside Tibet, who have suffered and continue to suffer so much. Gandhiji’s nonviolent resistance strategies aroused much interest in the US, Europe and other parts of the world not only among civil rights and peace activists and people’s movements the Hungarians used them after the Soviet Invasion of 1956 but also among military strategists. Paul Wehr in his articles on ‘Nonviolence and National Defense’ in the book, “Gandhi in the Post-Modern Age’ writes: Gandhi‘s ideas on nonviolent national defense made their way to a western world on the brink of war. Pacifists there were looking desperately for a viable alternative.” Kenneth Boulding’s essay “Path of Glory: A New way with War” proposed nonviolent resistance as a functional substitute for war. He observed that the technological revolution had made war dysfunctional. This point he made so many years ago continues to provide the basis for contemporary social defence research, as does his concept of transarmament. Boulding appears to have been the first to suggest that a notion, in this case Great Britain, adopt a nonviolent defense policy, though others like Lindberg in Denmark, Vrind in Holland and John Galtung and Arne Naess in Norway were thinking on the same lines Their work was a direct link between Gandhi and modern social defense policy. “By the late 1950s in the looming shadow of the mushroom cloud, social defense seemed more credible as an option for national defence. By 1962, the concept of ‘social defense’ had taken root in western Europe The 1964 Oxford Conference on civilian defense brought together peace researchers, military strategists and people having direct experience with nonviolent resistance. By 1980, ‘Social Defense’ or Non-military resistance’ had in one form or the other become an integral pair of overall defense policy in Denmark, Norway, Sweden and Finland. On the nuclear bomb, Gandhi’s views were clearly articulated by him in the tragic, aftermath of the nuclear bombing of Hiroshima and Nagasaki in August 1945: The moral to be legitimately drawn from the supreme tragedy of the bomb is that it will not be destroyed by counter bombs. Unless the world adopts nonviolence, it will spell certain suicide fro mankind. Albert Einstein echoed the same sentiments when he started: “The unleashed power of the atom has changed everything but our thinking; thus we are drifting toward a catastrophe beyond comparison. We shall require a new manner of thinking if mankind is to survive. What was Gandhi’s approach to societal, national global peace? It was based on the simple assumption that if one really wanted peace, one had to strive for peace rather than prepare for war. One had to cleanse one’s mind hatred, arrogance, avarice and fear, and avoid all actions, which create these emotions in others. Terrorism is dreadful scourge but it can neither be wished away, nor bombed off the face of the earth. Much of it today emanates from various brands of religious fanaticism or religion masked political extremism, though at deeper levels historical inequities in land distraction, living conditions, political, economic and cultural dominance and military presence are also involved. The 9/11 terrorist attack has traumatically shown how devastating the consequences of just one scenario of war, and ushered in the epoch of “asymmetric warfare” where the enemy is invisible, minuscule in number and strikes not from outside but from within our societies and nations. Then crucial issue to be faced by all countries plagued by violence and terrorism is whether peace and security are better pursued through justice and negotiated, mutually acceptable agreements based on the aspirations and legitimate demands of both parties in a conflict situation, or through massive preemptive or retaliatory military action, and multibillion dollar national security plans. Egyptian President Anwar Sadat’s heroic visit to Jerusalem in 1977 and the successful outcome of his subsequent peace negotiations with Israeli Prime Minister Izhtak Shamir at Camp David is irrefutable proof that the nonviolent, negotiated path to peace can and does produce outstanding, enduring results for both parties in a conflict situation, even in the most difficult times. Bultjens, Ralph (1984), ‘Foreword’. Gandhi in the Post Modern Age : issues in War and Peace by Standford Krolick & Betly Cannon (ed): Colorado School of Mines. Wehr, Paul (1984), ‘Non-violence and National Defence’ in Gandhi in Post Modern Age. Boulding, Kenneth (1937), Path of Glory: A New Way with War. Armstrong, Karen (1984), Battle for God, Toronto: Angli Can Centre. Huntington, Samuel P. (1997), Clash of Civilizations and Remaking of World order, Penguin Books.